Sparrowhawk (Accipiter nisus). Male. Taken at Abingdon, Oxon., on November 10th 2017. Male. Taken at Abingdon, Oxon., on November 10th 2017. Sparrowhawks are small birds of prey. Adult males have bluish-grey backs and wings and orangey-brown bars on their chest and belly. Females and juveniles have brown backs and wings, and brown bars underneath. Sparrowhawks have bright yellow or orange eyes, long, yellow legs and long talons. Females are up to 25% larger than males. They are widely distributed throughout the British Isles and in most of Europe. They are commonly found in forests and woods, as well as in parks and gardens. Nests are made high up in fir trees. 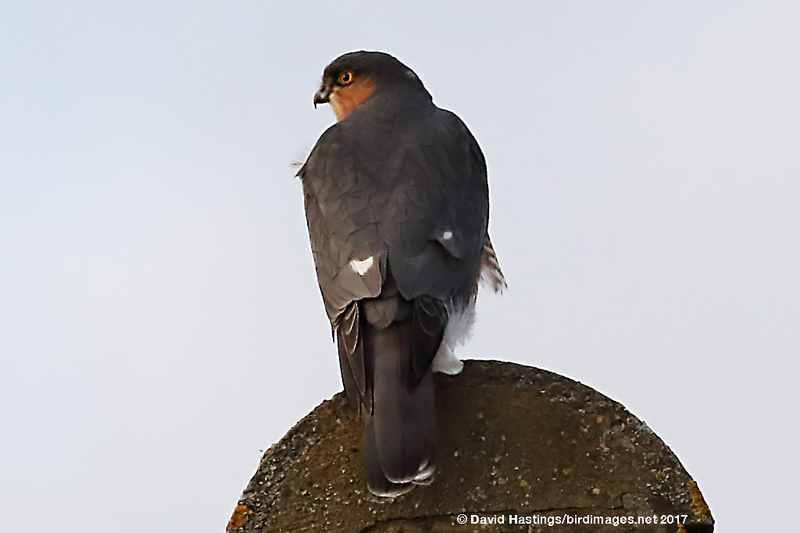 Sparrowhawks are ambush predators, and fly fast and low among trees, bushes and buildings to flush out small birds. The Sparrowhawk has Green status on the UK list. There are around 35000 breeding pairs in the UK.